"Temple and Jesus," The Jesus Database, an online annotated inventory of the traditions concerning the life and teachings of Jesus. Dr. Gregory C. Jenks, FaithFutures Foundation. Comparative texts about New Covenant Eschatology and Apocalyptic Speculation from Apocrypha, Pseudepigrapha, Targum, proto-Kabbala, Mishnah, Babylonian Talmud, and Midrash. 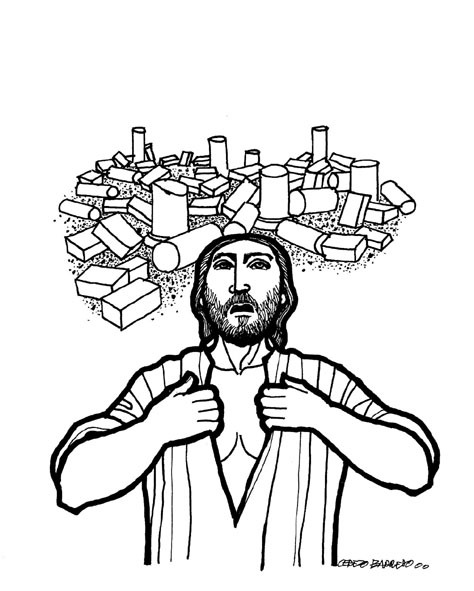 At Rutgers University, Mahlon H. Smith's Into His Own: Perspective on the World of Jesus. "This will be the result of your troubles and afflictions: they will be witnesses both before God and man of the treacherous and cruel dealing of your enemies, as well as of your steadfastness: A noble saying, that the afflictions of the godly and holy men pertain to the witness of the truth." "Though spiritual judgements are the most common in gospel times, yet God makes use of temporal judgments also." "Be calm and serene, masters of yourselves, and superior to all irrational and disquieting passions. By keeping the government of your spirits, you will both avoid much misery, and guard the better against all dangers." "You shall be in the Father's hand, saved, even if put to death, gaining eternally by suffering." Commentary, Luke 21:5-19, Gilberto Ruiz, Preaching This Week, WorkingPreacher.org, 2016. "Whenever a disaster strikes, it doesn't take long for some prominent Christians to blame it on the secularization or moral permissiveness of society." "Saying What We See," Karoline Lewis,Working Preacher, 2016. Lectionary Greek Rob Myallis, 2016. "Hope amidst Doom and Gloom," Glenn Monson, Law & Gospel Everywhere, 2016. "Our reading of this - especially in light of preachers looking for stewardship source material - is to praise this woman for sacrificial giving. We think of our own offering plates, and testimonies of sacrificial giving where God blessed the giver, and assume she was giving out of her heart. This may be true, but there is also another way to see this text." Commentary, Luke 21:5-19, Richard Swanson, Preaching This Week, WorkingPreacher.org, 2013. "...the Temple was beautiful because Herod, that Roman stooge who styled himself as King of the Jews, had spent massive amounts of money making it beautiful...."
"A Public Works Project," David Lose, Dear Working Preacher, 2013. "Given Jesus' promise of protection and confidence even during the most trying of situations, what is keeping us from imagining that through our worship and preaching God is at work fashioning and forming us as a public works project for the communities that surround us." " Jesus is correct that the most viable option for the people that suffer like the grass under the feet of the fighting elephants of political dysfunction, corporate greed, geopolitical conflict, and social indifference is to find a way to endure and stand firm." "How Not to Prepare for Catastrophe," D. Mark Davis, Left Behind and Loving It, 2013. "No Preparation Needed?" Alyce M. McKenzie, Edgy Exegesis, 2013. "The best way to prepare for calamity that could happen at any time is to always be looking for Christ in every person and circumstance." "By Your Endurance," Nancy Rockwell, The Bite in the Apple, 2013. "Jesus tells his friends, Don't anchor your faith in the beauty of the temple, but in your ability to endure evil, without flinching, and without looking away." "The Sky Is Falling! Everything Is Fine!" Danielle Shroyer, The Hardest Question, 2013. The Lectionary Lab, Pentecost +26, the Rev'ds Dr. John Fairless and Delmer Chilton (aka "Two Bubbas and a Bible"), 2013. Lectionary Lab Live podcast. "Why Perseverance Matters," Sharron R. Blezard, Stewardship of Life, 2013. "Rejoice and Endure," David Sellery, 2013. Lectionary Greek, Rob Myallis, 2010. "Falling Temples," Janet H. Hunt, Dancing with the Word, 2013. "Do you hear Jesus' words today as meant for us universally or cosmically, individually, or both/and?" "Prescribing Faith in the Holy," Nancy Mairs, Upper Room Books, 2013. A Wonderfully Ancient and Eternal Place, Andrew Prior, 2013. Commentary, Luke 21:5-19, David Tiede, Pentecost +25, Preaching This Week, WorkingPreacher.org, 2010. "Jesus never promised it would be easy to follow him." Luke 21:5-19, Comments (commentary) and Clippings (technical notes for in-depth study), Pentecost 24C, Chris Haslam, Anglican Diocese of Montreal. "First Thoughts on Year C Gospel Passages in the Lectionary," Pentecost 26, William Loader, Murdoch University, Uniting Church in Australia. "Trust in God has profoundly personal implications. It also has important political, social and religious ramifications." "How does one preach apocalyptic literature to people who are not suffering? Do we have to convince them that they are suffering for this literature to make sense?" The Destruction of the Temple Foretold, audio telling, story in episodes, graphic, audio and written commentaries. Go Tell Communications, Biblical Storytelling for the Global Village, 2010. "The text has nothing to do with predictions of the future, and any interpretation which treats it so is fatally flawed from the start. Luke was not written primarily for 21st-century Christians anxious about the future. It was written for a beleaguered and persecuted minority under the thumb of Rome." Holy Textures, Understanding the Bible in its own time and in ours, Luke 21:5-19, David Ewart, 2010. Things to Admire, Russell Rathbun, The Hardest Question, 2010. "What does the widow?s gift have to do with the sacrifice of Jesus?" "A Time to Bear Witness," The Politics of God: The Way to the Cross, Eugene C. Kreider, Texts in Context, Word & World, Luther Northwestern Theological School, 1986. "The religious leadership of the people of God bring upon themselves the destruction they are trying to avert..."
Wellspring of the Gospel, Ordinary 33, Catherine McElhinney and Kathryn Turner, Weekly Wellsprings. "When have you been faced with trials - and known that the only thing you could do was to endure them?" "Appearance over Content?" Larry Broding's Word-Sunday.Com: A Catholic Resource for This Sunday's Gospel. Adult Study, Children's Story, Family Activity, Support Materials. "How important are appearances to other? How important are appearances to you?" "Troubles and Persecution," Rev. Bryan Findlayson, Lectionary Bible Studies and Sermons, Pumpkin Cottage Ministry Resources. Includes detailed textual notes. "Jerusalem in the Last Days," a study from the Biblical Studies Foundation. Jerusalem Temple Warning Inscription at K.C. Hanson and Douglas Oakman's excellent site Palestine in the Time of Jesus: Social Structures and Social Conflicts. The Herodian Temple (photo of the temple model at the Holyland Hotel, taken by K.C. Hanson), at K.C. Hanson and Douglas Oakman's excellent site Palestine in the Time of Jesus: Social Structures and Social Conflicts. Bondi, Roberta, "One Plot at a Time," The Christian Century, 2004. Brueggemann, Walter, "The Terrible Ungluing," The Christian Century, 1992. Duke, Paul D., "Ruined Temples," The Christian Century, 1995. King, Michael A., "Now and Then," The Christian Century, 2007. Lueking, F. Dean, "Gaining One's Soul," The Christian Century, 1998. Walvoord, John F., "Christ's Olivet Discourse on the Time of the End: Prophecies Fulfilled in the Present Age," Bibliotheca Sacra, 1971. Willimon, William, "The Things That Make for Peace," The Christian Century, 1987. "Words and a Wisdom," the Rev. Amy Gearhart, Day 1, 2013. "All Will Be Thrown Down," the Very Rev. Samuel G. Candler, Day1, 2010. "Coming Soon," Jeremy Troxler, Luke 21:7-8, 25-38 Faith & Leadership, Duke Divinity, 2010. "Futurologists and their Vision for the Future," Edward Markquart, Sermons from Seattle. "Two Girls Prepare," children's story by Larry Broding, word-sunday.com. "When I Am Afraid," children's sermon, coloring page, word search. Charles Kirkpatrick, Sermons 4 Kids. "Greener Pastures," Eric Stapleton, dramatix. "The Fire and the Flood," Glenn Hascall, dramatix. "The Persecutor," David Marriott," dramatix. "Sanctuary," Richard G. Huxley, dramatix. "Taking Notes," Joanne Miller, dramatix. Commercial Site: Rumors of War, Films/Visual Liturgy based on RCL texts. Clip Art, Luke 21:9, Luke 21:15, Fr. Richard Lonsdale, Resources for Catholic Educators. Clip Art Images: Luke 21:5-19, Luke 21:5-19 #2, Misioneros Del Sagrado Corazón en el Perú. Luke 21:5-19 at Cerezo Barredo's weekly gospel illustration. Liberation emphasis.